Preface (B.A. Markert, A.M. Breure, H.G. Zechmeister). General aspects and integrative approaches. 1. Definitions, strategies and principles for bioindication/biomonitoring of the environment (B.A. Markert, A.M. Breure, H.G. Zechmeister). 2. Bioindicators and environmental stress assessment (O. Fränzle). 3. Bioindicators and biomonitors for policy, legislation and administration (K. Kienzl, A. Riss et al.). 4. Bioindicators for ecosystem management (C.M. Lorenz). 5. Predicting toxic effects of contaminants in ecosystems using single species investigations (R. Altenburger, M. Schmitt-Jansen). Bioindicators in use. 6. Standard tests. 7. Microbial indicators. 8. Lower plants. 9. Higher plants. 10. Invertebrates. 11. Vertebrates. International Programmes for biomonitoring purposes. 12. Environmental specimen banking (A.A.F. Kettrup). 13. Some concepts and future developments: developing agri-biodiversity indicators as a tool for policy makers (K. Parris). 14. USEPA biomonitoring and bioindicator concepts needed to evaluate the biological integrity of aquatic systems (J.M. Lazorchak et al.). 15. IAEA approaches to assessment of chemical elements in atmosphere (B. Smodiš). 16. Bioindicators and the indicator approach of the European Environment Agency (P. Bosch, U. Pinborg). 17. Critical assessment of international marine monitoring programmes for biological effects of contaminants in the north-east Atlantic area (P. Matthiessen). This book provides comprehensive single source coverage of bioindication/biomonitoring in the fields of ecology, ecotoxicology and environmental sciences; from the ecological basics to the effects of chemicals on the environment and the latest test strategies. 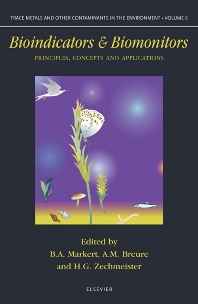 Contributions by leading figures in ecology from around the world reflect the broad scope of current thinking and research, making this volume essential reading for informed professionals and students. For professionals and students working in environmental sciences, chemistry, ecology, medicine, engineering and other related disciplines.